12 April 2018 // Léa Bayekula (22), born with Spina Bifida, is a graphics student in real life and a wheelchair athlete who wants to join the Paralympics in Tokyo in 2020. The challenges she meets in her daily life have become the basis of a fictional story, in which she is a journalist in Brussels. 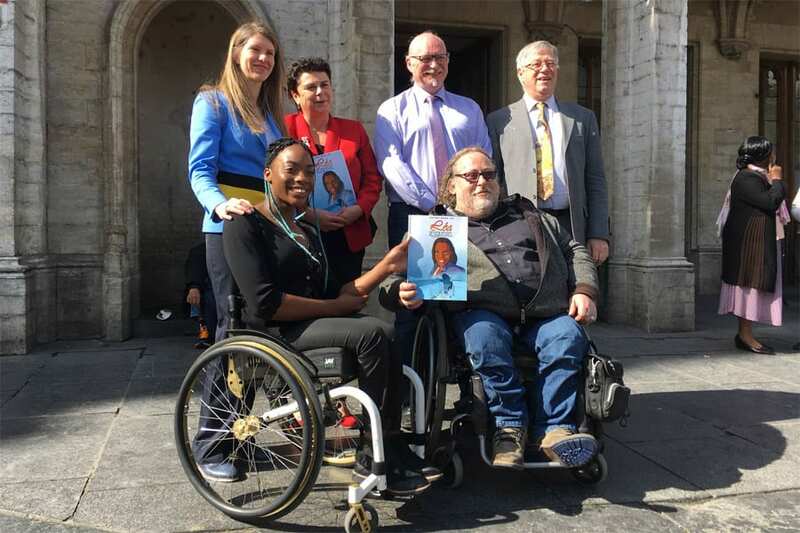 While following Léa doing her job, the story highlights the lack of accessibility in the capital city of Belgium, in particular of public transport. The scenario was written by Joël Saucin, at the request of Hans Van De Cauter, who first met Léa when he was involved in making a documentary about travelling with public transport when using a wheelchair. Léa then showed him the obstacles she regularly encounters and how she often needs the help of friends or strangers. Bernard Cattoor made the drawings, and Damien Gay did the colouring. The comic book is available in French, “Léa – Roue de secours”, and in Dutch, “Léa – Reservewiel”. It can be ordered by emailing to certitudes.aurore@gmail.com or to Hans Van De Cauter. In the near future, it will also be sold online through Bol.com and Standaard Boekhandel. The team of creators wants to publish more stories about Léa, with each issues focusing on another aspect of living with a physical disability and reduced mobility.